Above is a photo I took back in 2010. I was living on my own, and where I was living was roomy enough that I set up a “game room”. It was dominated by HeroClix. 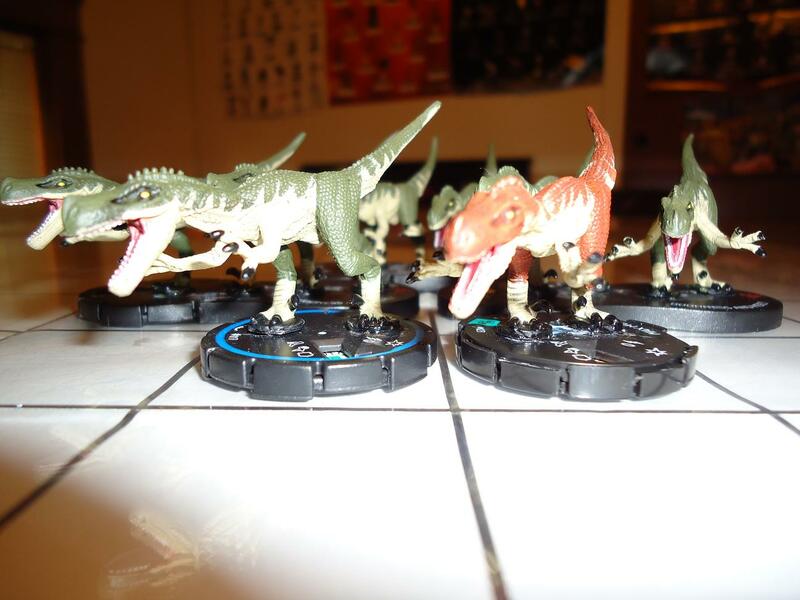 In the picture (which I’d posted to this blog at one point), I’d taken some extra Marvel and DC HeroClix dials, cut off the sculpts, then removed the sculptures from some of WizKids’ HorrorClix “The Lab” set’s Velociraptors I’d managed to get, and glued them to the bases; made my own HeroClix-compatible “mods”. Still have them. Well, WizKids has been flirting with the idea of making a set or two of HeroClix figures with in-house ideas, rather than relying on official licenses, as they do when using characters from Marvel comics and movies, DC comics and movies, various videogames, et cetera. Looks like one idea will hit games and comics shops soon: HeroClix “UNDEAD”. I’m excited. In a way that other attempts, like reviving its “MageKnight” brand (the game that gave WizKids its start, which lead to HeroClix) hasn’t been able to do. UNDEAD looks to be a smaller number of chatacters, “generic” (mostly), in single figure ‘foil packs’. Sounds perfect. Why? Sounds like it will be completely compatible with HeroClix, which provides thematic adversaries for our Heroes in HeroClix to combat. The superhero genre is such a mash-up of genres — sci-fi, cosmic/space opera, magic, fantasy, pulp crime, horror, et cetera — it makes sense and provides more options for players. Would love to see some other “generics” see publishing as HeroClix, given the “UNDEAD treatment”, so to speak. The old HorrorClix line’s “The Lab” set was chock-full of mad scientists, clones, aliens, cat-people, lizard-people, insect-people, mutates, dinosaurs, robots, apes, and even haunted spacesuits. Theme-y fun. EDIT: ChessClix, an idea I’ve wanted to see for awhile: do-able as a foil-pack gravity feed set? Had alway imagined them as 100% compatible with HeroClix, just with a “rulez overlay” for playing pieces as thier own game, as “ChessClix”.